This is a basic reading comprehension of single sentences pack. 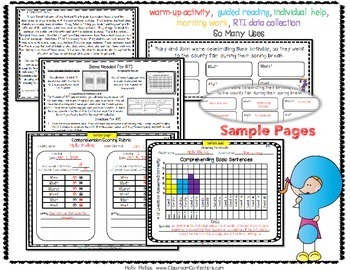 RTI Data Collection Materials Included. This pack can serve several purposes, and depending on how you want to use it will determine its grade appropriateness. After having several teachers in grades 1-5 review the pack, the conclusion was that it can be used for everyday type activities for your average second graders and can be used even in the fifth grade with ESOL students or for your very low readers that can decode but struggle with even very basic comprehension of more complex single sentences. I have found that some of my third and fourth grade low readers have a hard time deciphering or comprehending what a simple sentence is saying. This becomes apparent when students are reading basic directions. I say, “What is it telling you to do,” and they can’t pull the info. out of the sentence; sometimes even one basic sentence. They struggle to break the sentence into smaller parts to really ‘see’ what the sentence is saying. This is the reason I designed these cards. Sometimes I want something much more basic than a short story or even a short paragraph. Sometimes I feel it necessary to see if my students can even answer the basic who, what, where, when, why, and how from one single sentence. These sentences were written in a way that most all include a who, what, where, when, why, and how. Some sentences are lacking in one-two of those areas. In that case, the students should be able to say that the info. can’t be found or not enough info. given in order to get credit. One use for these cards is for instructional purposes. 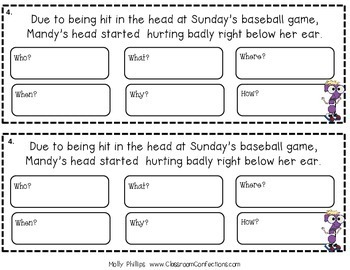 I might use these in a small guided reading group as a warm-up with my weaker readers, or I might have certain students complete them as part of a center activity and then discuss them later. I might even use them individually if I have just one weak reader. Another use for the cards is to aide in your RTI process when needing documentation. 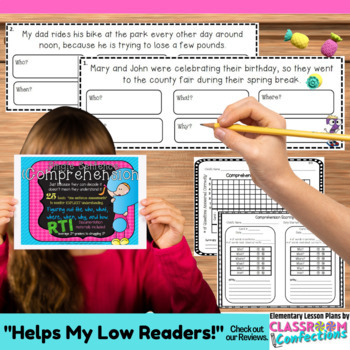 These cards can be used for students who have on-level decoding skills, but they are low in the area of understanding/comprehension. If you are choosing to use them for the RTI process, I have enclosed suggested directions on how to document. Please see the thumbnail images to see an image of what is included, but here is the rundown. Please, if you notice any typos on any of the materials, send me a message and I will get a new copy uploaded as soon as I can. Subway Art – Reading Themed – Looks Cute On Your Desk! Book Shower- Great way to get books for your classroom! For other creative lesson ideas, click on ‘elementary lesson plans’ by my picture above.